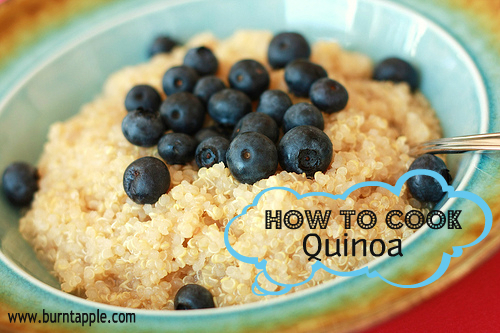 How to Cook Quinoa: Two Ways! Quinoa is one of my favorite grains. It is full of protein and packed with lot’s of vitamins. It is so easy to cook with and adapts easy to many recipes. One of the great things about quinoa is it cooks much like rice and has a delicious nutty flavor. It’s fantastic as a main dish or even in a dessert. Pour quinoa into a fine mesh strainer. Rinse the quinoa completely under cold water. Note: Quinoa can have a bitter taste if not rinsed before using. Some packages sell pre rinsed quinoa, so rinsing may not be necessary. Always check your package. Pour rinsed quinoa and water into a medium saucepan. Bring the water to a boil. Once water comes to a complete boil, cover and turn the heat to low. Cook for an additional 2o minutes until all the water is absorbed. Fluff quinoa with a fork. Makes 4 1/2 cup servings. Grease the bottom of your rice cooker lightly with oil. In a fine mesh strainer, rinse the quinoa under cold water. Transfer the quinoa to the rice cooker. Pour in the water, cover and set the rice cooker to cook. When rice switches to the warm setting, fluff with a fork and serve. Makes 4 1/2 cup servings. *Note: Quinoa has a bitter taste if not rinsed before cooking. There are various pre rinsed quinoa brands on the market, so check to see if your quinoa is pre rinsed.